Claude Monet often examined a subject over time, in many paintings. Like he did with his Haystacks series, Monet captured the changing effects of light in the atmosphere by painting the same subject, the façade of the Rouen Cathedral, multiple times. And then, beginning in February 1892, Monet started on what would become a series consisting of more than 30 canvases all depicting the same subject from the same vantage point. Rouen Cathedral Notre-Dame is a medieval late gothic cathedral north of Paris in the town of Rouen, France. For Monet, the cathedral gave him the opportunity to show how light transformed the building throughout the days’ changing sun or weather. In the late winter 1892, Monet rented a space at local shop a slight angle and across from the cathedral. From this vantage point, he would be able to see the church and document its change in appearance, while still being protected from the weather. He stayed there until May painting the same view. However, his presence in the shop created a distraction for shoppers, so he was forced to paint from behind a screen. The following year when he returned to paint again, the shop owner was less accommodating and Monet had to find space else ware. Luckily, he found a couple locations that gave him an almost identical view. Each canvas depicts the same image – that of the façade of a cathedral. Monet would have multiple canvases ready to be worked on at once. When the light changed during a painting session, he would grab a new canvas and start on a painting with the new colors. The next day, when the light was similar to the earlier canvas, he would go back and work on it. At some points Monet would have as many as fourteen canvases in progress all ready to be continued, refined, reworked, and finished. They all show the same basic structure; the front of a cathedral with arched doors in the middle and towers on each side. The pictures are cropped so that the building dominates the canvas with only a small hint of sky to the top. Even though Monet shows the same structure in each picture, they are all remarkably different. In some, shadows determine the color casting a dark blue over the picture. In others, a setting sun drapes the church in warm pinks and oranges. In others, the stone can be seen shinning brown in the afternoon sun. For Monet, the church gave an unchanging backdrop to show the changing effects of light. Whereas in his Haystacks, the environment would change – the view of the land differs in each painting, the number of haystacks changes, the sky differs as the weather and season passes. Rouen Cathedral provided a solid structure that would reflect the changing atmosphere. Usually, a church evokes many emotions, symbols, and religious motifs. But with Monet’s Rouen Cathedral, he removes all of that. 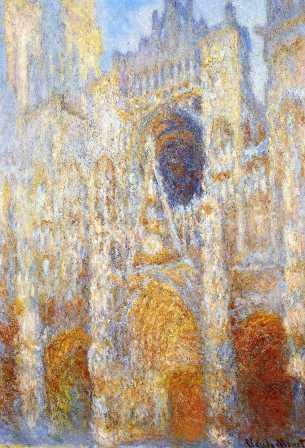 In Monet’s paintings of it, the cathedrals sole purpose is to provide a structure full of crevices, curves, and shadows. Monet went to Rouen to paint the cathedral twice, in 1892 and 1893. In those two years he painted thirty canvases but kept them from public view. He painted quickly when he was in the moment in front of the cathedral. After that, he took the pictures back to his home in Giverny and meticulously reworked them. Monet’s intention was always to show the series as a whole; twenty canvases in one room. From 1893 to 1895, Monet reworked the pictures to provide continuity between them. As they were a series, they had to work together; they had to be unified. When they were all displayed together in 1895, they were arranged as if the sun was passing over – starting with grey compositions showing dense fog and moving along as the sun passes over. In the late 1800’s, Impressionism was still considered radical, loved by the avant-garde, and sometimes perplexing to the casual viewer. It requires some work by the observer, and in the case of the Rouen Cathedral series, some distance. If one stands too close, the picture is difficult to make out just areas of color with no form. Once the viewer steps back, the image becomes clearer. The effect standing in a room surrounded by these paintings arranged as a day progresses must have been something very new and very wonderful for visitors to the gallery in 1895, and it helped cement Monet as not just modern painter but as a leader of a movement that would change art forever.